On 6 September, China Electricity Technology Market Association organised the 2018 (5th) Electricity Technology Management Forum in Ningbo, during which, the prize giving ceremony of the 2018 Gold Bridge Award of China Electricity Technology Market Association was held. 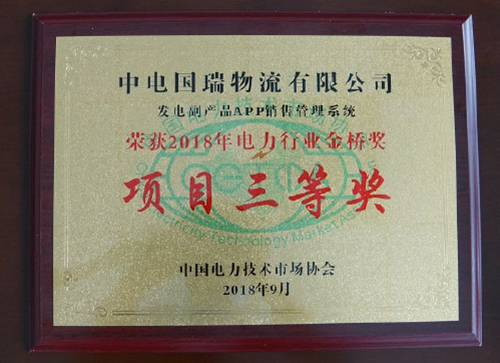 The Electricity Generation By-product APP Sales Management System of CLP Guorui Logistics Co., Ltd. won the third prize of the 2018 Power Industry Gold Bridge Award, which marks an important breakthrough of CLP Guorui who continues to seek innovation for development and efficiency in management. The Electricity Generation By-product APP Sales Management System is the first of its kind in the industry. The system is constructed based on “Internet+sales”. After around half-year of effort in development, over 10 technological barriers were successfully overcome, which enables the monitoring and management of the sales of electricity by-products at all stages and communications with customers. The system has been put into operation since 2016, monitoring the work of two million kW machine units of Changshu Electric Power Generating Company. Since its official launch in July 2017, it has received acclaims from suppliers and customers. The system resolves the difficult problems encountered by power plants in the sales of fly ashes, for example, vehicles queuing, dispatch allocation and price adjustment, and is of significant importance to safe production. CLP Guorui obtained the software copyright of the Electricity Generation By-product APP Sales Management System in 2017. The system has already been put into operation in two million kW machine units of Pingwei Electric Power Generating Company on a trial basis. CLP Guorui strives to modularise and commercialise the system while further promoting its application.